The Orchid Column: Is There a Blue Orchid? Is There a Blue Orchid? There are a couple contenders for the 'Blue Orchid' crown. 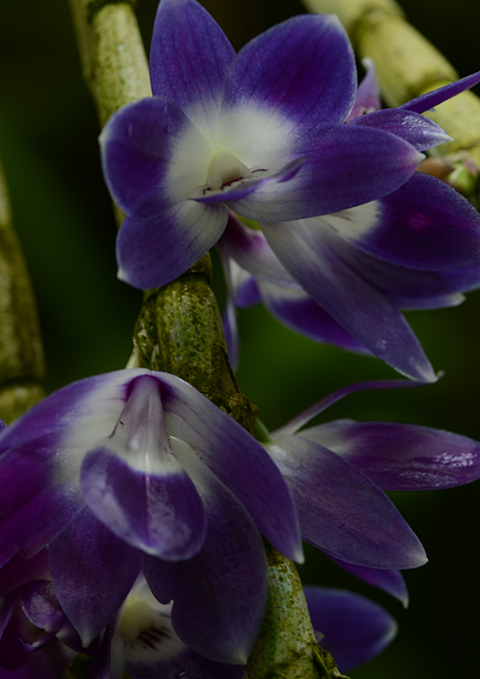 One of them is the royal blue Dendrobium victorieae-reginae. This beautiful orchid with pendant pseudobulbs and waxy blue-violet flowers is native to the Philippines where it grows at moderately high elevations (1300 to 2600 m) in wet mossy forests. Our plants are permanent residents of the Tropical High Elevation House where they grow at eye level on a driftwood tree. The forests in which this species grows never experiences a regular dry season, so our cultivated plants are watered throughout the year. The name victoriae-reginae denotes that the plant was named in honor of Queen Victoria whose Golden Jubilee was celebrated around the time of its discovery in 1897. The other species that that comes up in any discussion of blue orchids is Vanda coerulea (coerulea= sky blue) which has imparted its blue violet pigment to many richly colored hybrids. Both of these orchids are extremely popular. What do you think--does either orchid deserve the name 'Blue Orchid'?